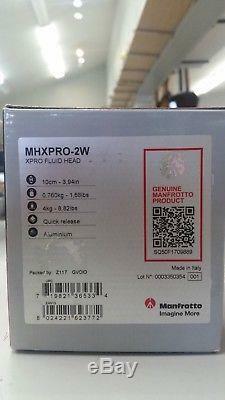 Manfrotto XPRO Video Fluid Head. Quick set up and fluid movements. The Manfrotto XPRO Video Fluid Head (MHXPRO-2W) is the best choice for photographers wanting to start shooting videos to expand their creativity. It's also the best fit for birdwatchers who are using lightweight scopes to observe wildlife. Also, it's good for digiscoping through an additional camera; the fluid head moves constantly to get the perfect shot. The XPRO fluid head is the only lightweight video head with a fluidity selector -- this makes it possible to switch between hard and soft fluidity according to the preferred speed of tilt movement and the kind of gear used. Its fluid cartridge settings ensure stable videos can be made with any photo lens. Its and aluminum body make the XPRO fluid head extremely easy to carry. Weighing a mere 1.5 lbs. (0.7kg) and supporting up to 8.8 lbs. (4kg) of payload, it introduces a new design approach that enhances video head transportability. The MHXPRO-2W comes with the Manfrotto 200PL plate , the most widespread photographic plate, which guarantees a quick setup and a quick switch from photo to video. 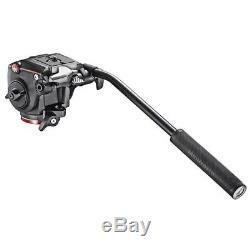 Professional Fluid Drag System on PAN and TILT movements. Adjustable fluidity on TILT movement. Quick release plate for fast camera connection and set up. Flat base for multiple tripod connections. Bubble level for easy setup. Lightweight technopolymer and aluminum body. Ideal for scopes and video cameras. 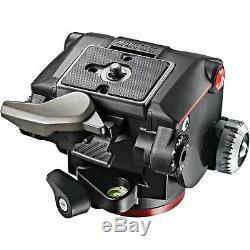 The item "Manfrotto XPRO Video Fluid Tripod Head with 200PL Quick Release Plate NEW" is in sale since Thursday, June 14, 2018. This item is in the category "Cameras & Photo\Tripods & Supports\Tripod Heads". The seller is "bigstarpawnshop2012" and is located in Midvale, Utah. This item can be shipped to United States, Canada, Australia, Japan, China, South Korea, Indonesia, Taiwan, South africa, Thailand, Hong Kong, Israel, Mexico, New Zealand, Philippines, Singapore, Saudi arabia, United arab emirates, Qatar, Kuwait, Bahrain, Malaysia, Brazil, Chile, Colombia, Costa rica, Dominican republic, Panama, Trinidad and tobago, Guatemala, El salvador, Honduras, Jamaica.